William Arthur Blog: Color Trends | Pink! 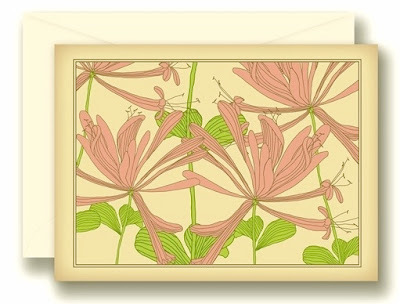 You might have heard by now that Pantone's color pick for 2011 is Honeysuckle Pink. "The intensity of this festive reddish pink allures and engages. In fact, this color, not the sweet fragrance of the flower blossoms for which it was named, is what attracts hummingbirds to the nectar..." explains Leatrice Eiseman, executive director of the Pantone Color Institute. Maybe it's time for a box of our Pink Florets Garden Notes, featuring the pink bell-shaped flowers of the honeysuckle vine! Gorgeous color! We love it for stationery!